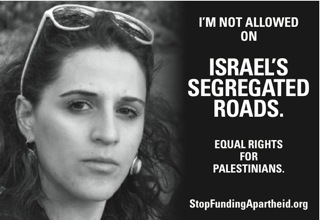 “I’M NOT ALLOWED ON ISRAEL’S SEGREGATED ROADS” says a West Bank Palestinian in one of a series of newspaper ads launched this week by Seattle Mideast Awareness Campaign (SeaMAC). The ads are part of SeaMAC’s continuing effort to expose the misuse of U.S. taxpayer money to support Israel’s system of segregation and discrimination against the Palestinian people. Palestinians are prohibited from driving on segregated Israeli-only settlement roads; Palestinian students inside Israel are channeled into a segregated school system with separate and unequal resources; and Palestinians are not allowed to live in illegal Jewish-only Israeli settlements. The print ads continue the campaign begun by SeaMAC’s bus ad and billboard campaigns. Last December, SeaMAC’s Metro bus ads, “ISRAELI WAR CRIMES: Your Tax Dollars At Work,” were first approved, accepted and printed, then suddenly cancelled by King County. A subsequent billboard campaign with the slogan “EQUAL RIGHTS FOR PALESTINIANS – Stop Funding the Israeli Military” was approved and accepted by Clear Channel Outdoor, and three of the four contracted billboards were put up for the first week, but then were taken down by Clear Channel. The ACLU is representing SeaMAC in a lawsuit against King County for violating SeaMAC’s constitutional rights by refusing to honor the contract to run the bus ads. The lawsuit will come to trial starting on October 31 of this year. For the full-sized ads and press release, click here.